Calgary’s Haylen Astalos has never attended a fundraising conference. He has never participated in a webinar to learn about the latest fundraising techniques. He does not have a college degree in philanthropy, nonprofit management, or fundraising. Nevertheless, now at six-years-old, Astalos has figured out what it takes to successfully raise money. To raise more money, Astalos opened an ice-cream stand. With winter, he began selling hot chocolate. As he achieved each goal he set for himself, Astalos set a new goal. So far, he’s raised thousands of dollars for his favorite charity. 1. Go with your passion. Astalos did not raise money for just any charity, nor did he let his parents pick a charity for him. Instead, he chose to support a nonprofit organization that was personally meaningful to him. His passion for the cause drives his activity and inspires others. When looking for a fundraising position, be sure to factor passion into your decision. While you might have some success working simply as a hired mercenary, you’ll likely have greater success and experience greater personal fulfillment if you work for a cause you can be passionate about. 2. Be flexible. Astalos raised funds by selling ice cream in the summer. 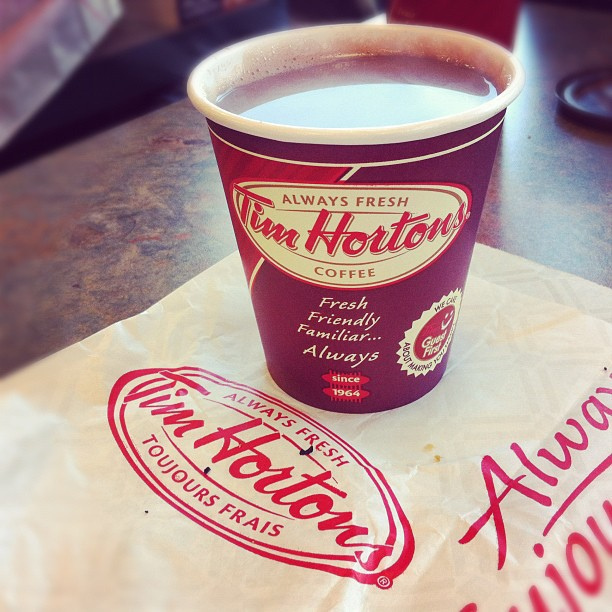 When the Alberta winter came, he changed products and began selling hot chocolate, something much more appropriate for the season. In order to seize opportunities and maximize success, you need to be nimble and adaptable. While careful planning is certainly important, so is being flexible. In a cautionary tale earlier this week — Part 1 of a two-part series — I looked at the missteps one nonprofit organization took by not taking the time to get to know one of its loyal donors. In Part 2, I now examine a horrible fundraising appeal from an organization that actually knows its potential donor quite well, though it failed to leverage that knowledge. I originally got the idea for this post from one of my readers who contacted me with a link to an interesting New York Times article: “A New Effort Has Doctors Turn Patients Into Donors.” My reader wanted to know what I thought of the emerging trend of having doctors actively contact their patients for fundraising purposes. I delayed writing about this subject because I have mixed feelings about it. Then, in December, I received a year-end appeal from my surgeon at the University of Pittsburgh Medical Center Cancer Center. The letter helped crystallize my thinking. First, let me share a bit of background. A recent study by Dr. Reshma Jagsi, a radiation oncologist and ethicist at the University of Michigan, was published recently in The Journal of Clinical Oncology. It was the first major examination of the role of physicians in fundraising. Another issue is, how will giving or not giving affect the level of care, or perceived level of care, from the doctor? Will patients feel coerced to give? While I see the enormous potential for ethical pitfalls, I also see the significant potential benefit of having doctors involved in the fundraising process. The issue is how and when they are involved as well as the quality of development training they will receive. For example, if I’m half-naked in my doctor’s examination room, I certainly do not want to receive an ask for a contribution. If I’m drowning in hospital bills, I’m not going to be particularly receptive to a fundraising appeal. However, if a development staff member wants to have lunch with me and my doctor to discuss the physician’s latest research, I’m perfectly amenable to that. There are right ways and wrong ways to involve doctors in the fundraising process. 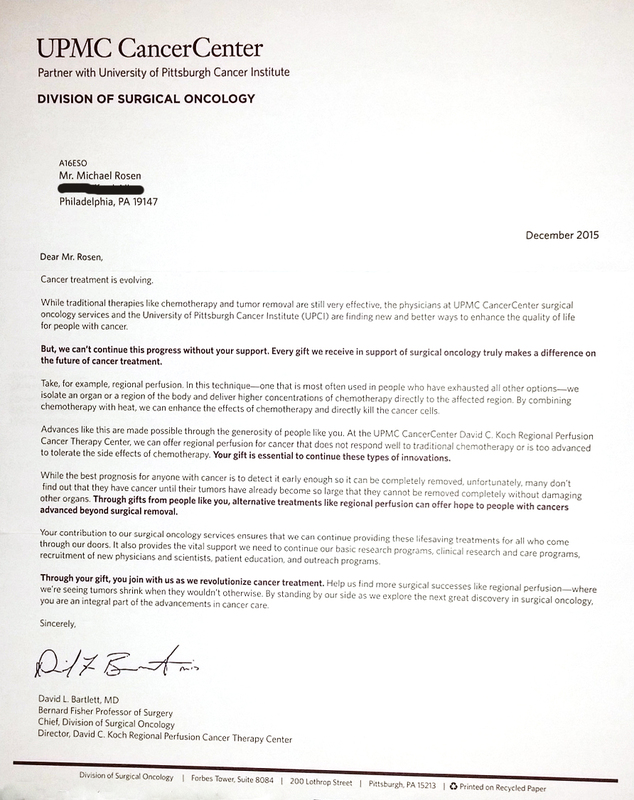 UPMC Cancer Center Direct-Mail Appeal. Dr. Bartlett knows me very well. In addition to knowing me as a patient, he knows that I’m a professional fundraiser who shares his passion for finding a more effective treatment for PMP. The development staff also knows me. Prior to going for surgery two years ago, my wife and I reached out to and met with one of the development professionals for the UPMC Cancer Center. Yet, despite their knowledge of me, they sent me a piece of garbage intended as an appeal letter. The direct-mail solicitation was definitely not the way to involve my doctor in the fundraising process. 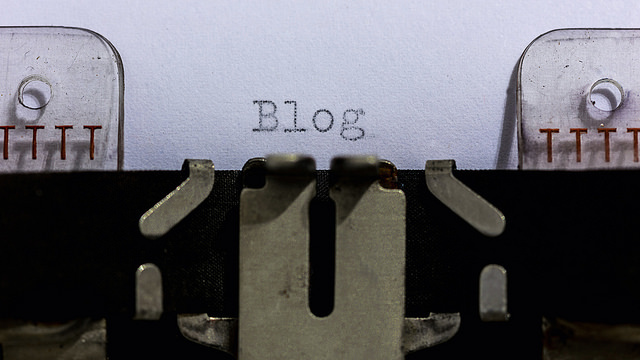 How well do you need to know your donors? You need to know your donors well enough to know how to effectively steward them in a way they will appreciate. You need to know them well enough to know to avoid doing something stupid that will alienate them. You need to know them well enough to engage them in meaningful ways. Let me share a story that illustrates my point. My wife Lisa is a proud Smith College alumna. She has been a leader with the Smith College Club of Philadelphia. She has referred students to the College. She has donated to the annual fund and capital campaigns. She has volunteered as a Class Agent. Several years ago, she even included Smith in her will, becoming a member of the College’s Grécourt Society. Over the years, Lisa has received mailings specifically for Grécourt Society members, including invitations to special member events. Recently, in advance of her landmark reunion, she received a fold-over postcard mailing that included an option to request a replacement Grécourt Society pin if she needed one. As it turns out, Lisa did need a replacement, so she happily responded. 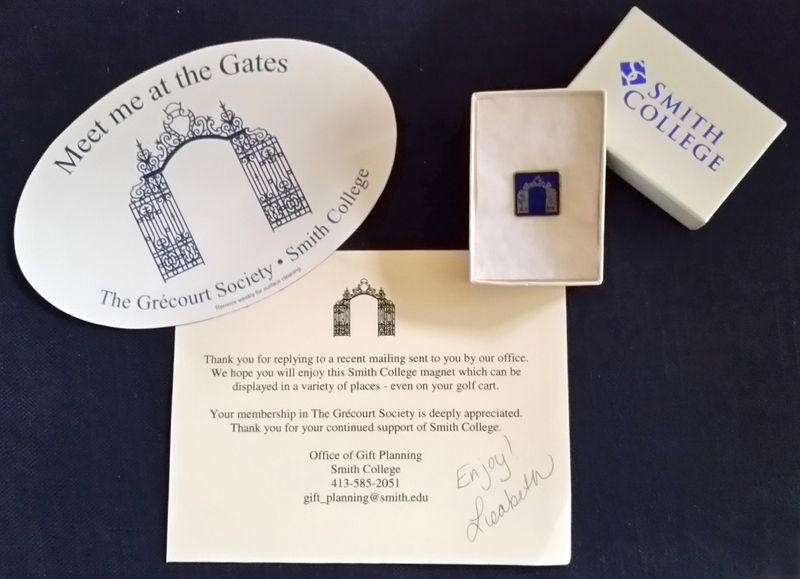 Then, Lisa received the package from the Smith College Office of Gift Planning. The package included the Grécourt Society pin, a surprise magnet, and a preprinted thank-you card that was hand-signed by Lisabeth. Ouch! While trying to do something nice, Smith stumbled badly.